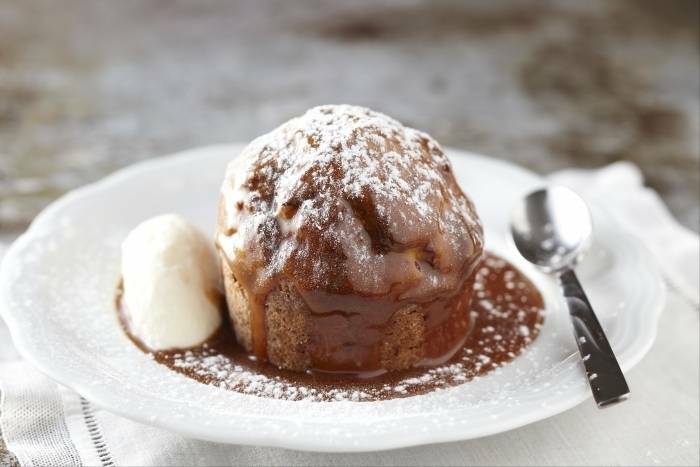 A spiced date pudding with a buttery toffee sauce and a brandy flavoured cream. Coat the inside of the silicon moulds with softened butter and then dust with flour. Place the butter and brown sugar in a food processor and blitz until fluffy. Add the eggs one at a time, fully incorporating each one before adding the next. Add the dates to the butter, eggs and sugar and blend until smooth. Transfer to a bowl and then fold in the sifted flour. Pour the mixture into 6 moulds, transfer to the oven and bake for 15-20 minutes. Check the cooking by inserting a small skewer into the centre - your cake is ready when it comes out clean. Allow to cool in the moulds. For the brandy cream: Mix the icing sugar with the brandy and the double cream. Whisk until it has thickened. To make the butterscotch sauce, put the sugars in a saucepan over a medium heat until they have melted. Add the butter and mix in with a spoon or spatula. Finally, add the cream and bring back to the boil. Turn the puddings out of the moulds and pour the butterscotch sauce over them. Finish with a quenelle of the brandy cream.